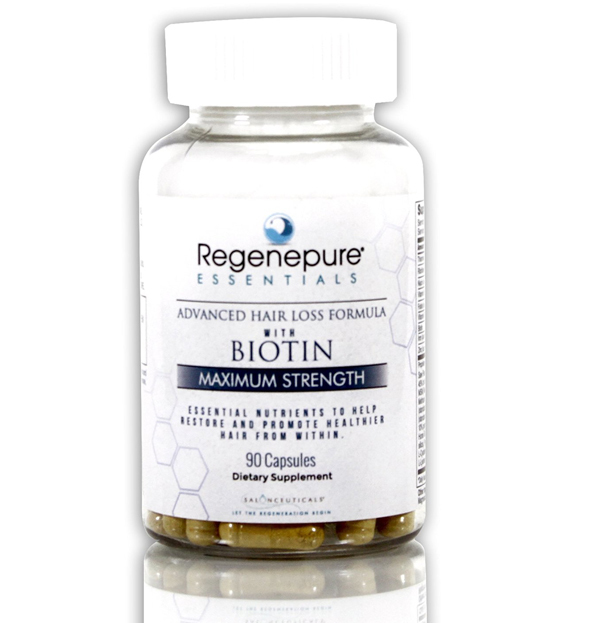 Regenepure takes serious hair restoration to an internal level with our newest formulation -Regenepure Essentials Advanced Hair Supplements with Biotin. This carefully crafted supplement contains a complex mix of vitamins, nutrients and extracts to promote robust hair growth and health over time. Whether used alone or as part the Regenepure hair restoration system, the Regenepure Essentials Advanced Supplement delivers effective skin, scalp and hair results that work from the inside out. If you’re wondering “where can I buy biotin pills?” you’ve came to the right place! 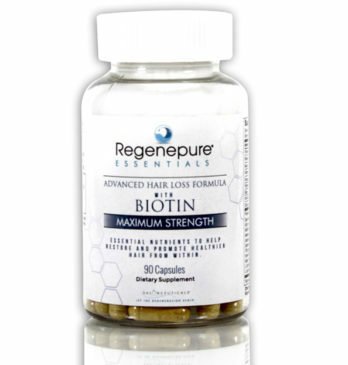 Regardless of the underlying cause, Regenepure Essentials Advanced Hair Loss Tackling Formula with Biotin supplement for hair can provide internal support for keeping the hair you still have healthy and possibly promoting regrowth in areas where you don’t. With ingredients like Niacin, Vitamin A and Fo-Ti Root Extract to aid in circulation and Lecithin, Iodine and Biotin for growth, this powerful hair supplement can be taken by anyone experiencing scalp and hair loss issues. Zinc, Arginine and a complex of B Vitamins assist in restoring and maintaining the overall health and wellness of hair, skin and nails. Doctor endorsed and physician recommended, Regenepure formulates to the highest standards and performance which is why our Regenepure Essentials Advanced Hair Loss tackling Formula contains only the best possible ingredients to help re-hair your head. Buy biotin online at Regenepure.com today! A printing error on the label of the newest batch of the Regenepure Essentials Biotin Supplement was noted:Folate (as folic acid) daily percentage value is 500 mcg. (not 500 mg as printed on the label). The formula for the supplement remained the same and is in compliance with the U.S. Recommended Daily Allowance.